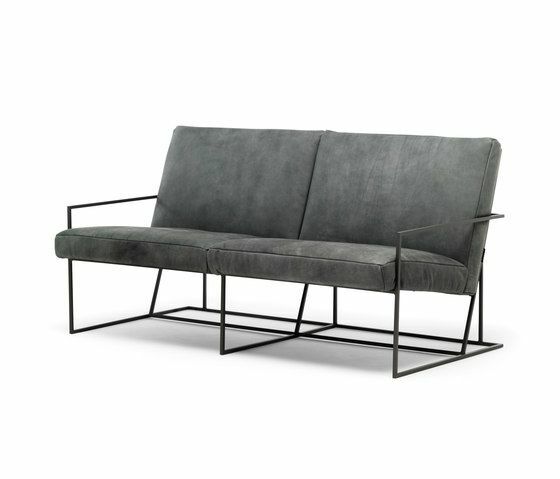 The distinctive linear geometry and the visual lightness of the Gotham sofa come from its metal frame, a clean aerial structure that holds the seat and backrest cushions. These in contrast are generous and voluminous thus creating a visual juxtaposition between the supporting base and the upholstered elements, between structural need and seating comfort. The Gotham sofa is a perfect two-seater for smaller spaces. Combined with the armchair and pouf of the same line it creates a full and yet contained living room set. Grey cadet painted structure, polyurethane cushions with fabric or leather covers. The steel structure can be painted in other colours upon request. Our collection blends aesthetic and technical innovation together with familiarity.